Winona grew up near where I did–this is the home and farm where I grew up; hers was just several miles away on a different road. Our farm is now owned by an Amish family. I grew up on a five-acre farmette, the second of eleven children. We lived so close to a busy U.S. highway that when semi’s would pass by fast, the house would kind of shake. We had two milk cows and two horses. The cows provided us with plenty of milk and cream that Mom would dip off the top. She put the cream into a glass urn that had a paddle inside and a turn-handle outside, and we kids cranked until it turned to butter. 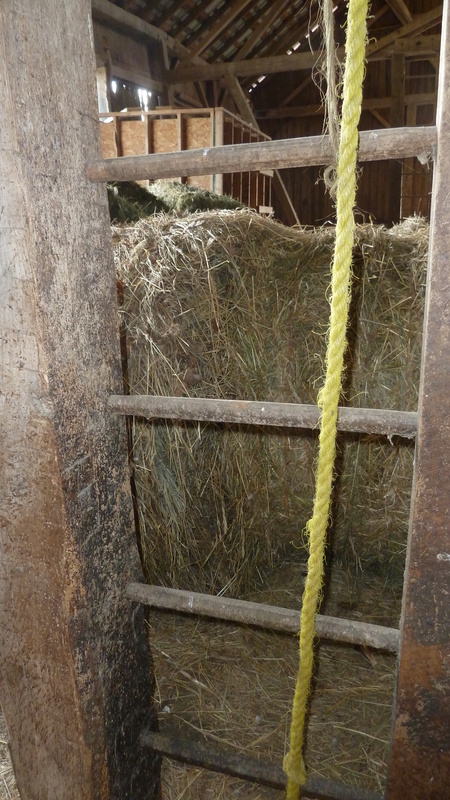 Typical haymow in a barn. We grew about two acres of field corn for the cows and horses. We kids kept most of the weeds out of the corn. In the fall we husked the corn and brought it to the barn with Dad’s help. It kept us “out of mischief.” Dad promised us a new bike after all the work one summer, but I think we waited two summers, the funds must have been low. But we did get a new red Western Flyer, the Cadillac of bikes back in the day. One bike for all of us. It got lots of use. We also had a big garden: lots of planting, weeding and harvesting. In the fall Mom would also order six or seven bushels of peaches from somewhere. To can them, we cut the peaches in half, pried out the stone, and peeled them. Then we stacked the halves nicely in clean quart glass jars, face down. Next a hot sugar syrup was poured into the cans. We put on the lids and gave the jars a boiling hot water bath for 20 minutes in a blue granite canner. We’d have yummy peaches all winter long. Mom was always there to help and teach us how. We also had five nice pear trees bearing pears to eat and can. My dad was a carpenter by trade. Often after work in the summer, he would take the horse and buggy with his trailer and a big homemade wooden fishing boat, and went to a small local lake to fish. One or two of us kids would always go along. Many times, we’d catch a big bowl of fish. My sister, brother, and I would sit in the yard to scale and clean them. What a yucky job, but good eatin’. We didn’t have running water, so we did the running. Dad built a washhouse a little ways out from the house, with a big iron kettle over an enclosed fire pit. 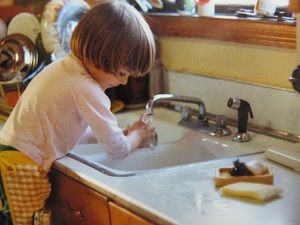 The night before laundry day, my sister Bonnie and I would carry buckets of water from our outside well that had a small gas engine to pump water. It took quite a few trips to get the kettle filled. The next morning, Mom got up early to start a fire to heat the water. ‘Twas great news if one of those big semi’s had a tire blow—that gave Mom fuel for a hot fire and the water heated quickly. With a large family and a wringer type washer, laundry days were usually an all-day affair. Sometimes hobos would walk past on the busy highway and ask for food. Mom would graciously fix them an egg sandwich and tin can of chocolate milk. They were ever so thankful. My own daughter Tanya scrubbing the sink after helping with dishes. Oh the dinner dishes we had after the evening meal! That was my sister’s and my job. On nice summer evenings it was tempting to run outside and play for a while before dark. We’d play “Andy I Over,” throwing the ball over the washhouse roof to someone on the other side. If they caught it, they’d sneak over and try to hit us with the ball. We also did lots of cartwheels, skated the sidewalk with our one pair of clamp-on skates, played badminton, climbed trees, played Gray Wolf, Kick the Can and Hide and Seek. In the meantime, the dirty dishes waited. Mom was busy with the little ones or doing mending or sewing. We did have lots of fun, not always doing work and chores. Mom and Dad played Rook (card game) with us. Every Saturday Mom went to town for groceries and often she brought home a jigsaw puzzle for us. Many good memories! 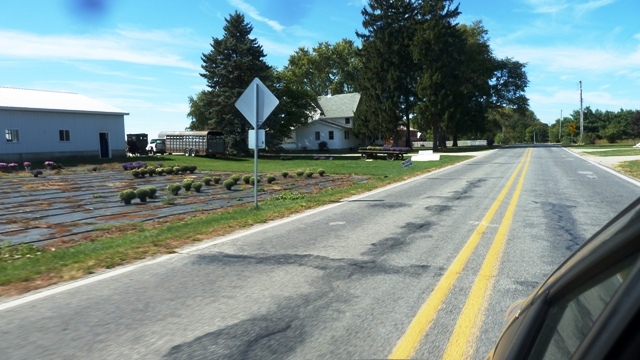 If you would enjoy reading weekly stories like this from an Amish columnist with eight children, check out Lovina’s Amish Kitchen and subscribe to her weekly column which we at MennoMedia syndicate. Plus like the Facebook page we keep for her if you’re on Facebook. Nostalgia for your growing up days? Do you remember the work, or the play? Comment by emailing me at anotherwaymedia@yahoo.com or Another Way Media, P.O. Box 363, Singers Glen, VA 22834. I love reading about these days of a simpler time! (Although, I have to admit, I’m glad I’m not the one trying to do laundry in this fashion!) I enjoyed this guest post. Will go follow Lovina’s Amish Kitchen too. You know, I have considered writing about the lifestyle in what was once a suburban area in the Santa Clara Valley decades ago, but I think that it would be too saddening to talk about such issues. When I tried to recreate the lifestyle at a home of my own, it failed. Modern building codes and ordinances limit so much of what can be done on one’s own land.